This month we shine the accommodation spotlight on a new property in Tarangire National Park. Recently returned from Africa, African Travel Specialist George tells us more about this stunning property. Mpingo Ridge Lemala is located on a high ridge, offering stunning views overlooking the Tarangire River and valley. A sister lodge of Lemala Kuria Hills and Lemala Nanyukie, Mpingo Ridge’s reputation precedes it despite only opening in July 2018. Experience true contemporary luxury in the African savannah and witness firsthand the glorious views that make this lodge so unique. George loves the shared open spaces and friendly atmosphere the lodge and team create. According to George, there’s no better way to end a day than in the main lodge with a drink, overlooking the glistening pool and stunning park below. Tarangire National Park, the sixth largest park in Tanzania, is where you will find Mpingo Ridge Lemala. Nothing tops a beautiful getaway where you are surrounded by green roaming plains, rivers and woodlands. On safari, you can expect to see elephant, zebra, giraffe, buffalo, leopard and wildebeest. End your day watching the sunset over the plains from the comfort of your own private deck! Enjoy unparalleled views over the park from your room positioned across the top of the ridge. 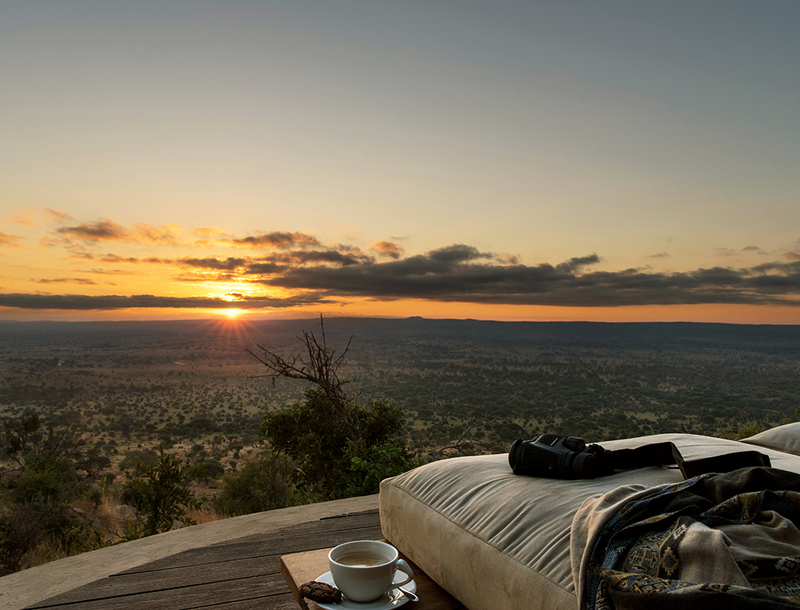 Witnessing the sun rising and setting over the African plains is a truly unforgettable experience. In your spare time, enjoy a blissful moment to yourself by the infinity pool, enjoy a drink at the bar or relax with a book in the lounge. During the evening, make sure you gather around the fire and swap stories about exciting encounters you have had on the day’s safaris! Experience the African plains by foot or by vehicle. Start the day at Mpingo Ridge with a wildlife walk, lead by a guide and ranger. Alternatively, venture out on a safari game drive, whether it’s the morning, afternoon or evening. It is an exciting experience to be the first to spot the breathtaking elephant that Tarangire National Park is so well known for! If you’re after something truly unique, one of our favourite experiences is seeing the Tarangire from soaring heights in a hot air balloon. Afterwards, be sure to take advantage of the outdoor spa enjoying a massage with views of the endless plains and roaming wildlife. So, what are you waiting for?! Talk to our African Travel Specialist team today about your Mpingo Ridge experience.